In the second episode of “Justified’s” sophmore season, Deputy U.S. Marshal Raylan Givens (Timothy Olyphant) and Winona Hawkins (Natalie Zea) appear to be having a friendly conversation about his wardrobe, but it begins heating up into an argument as soon as Raylan offers to go get coffee. Unsurprising for the two of them: Winona happens to be Raylan’s ex-wife, and the two have rekindled their affair after Raylan saved her current husband from a sadistic hitman. Even more unsurprising, despite the clear attraction both have for each other, Winona is convinced the affair can’t end well. It might not tell Winona exactly what she wants to hear, but it does tell the viewer something very important: “Justified” (10:00 pm, FX) knows exactly where it’s supposed to be. Four episodes into its sophmore season, “Justified” has been on a hot streak of purpose and energy that’s fast turning it into one of the most entertaining shows on television. Watching the show unfold, we’re not only getting a new arc to challenge Raylan’s old-fashioned law sensibility, but we’re seeing a show deepen its mythology to the point that Harlan County might be one of the richest storytelling environments on screen. As I wrote in my earlier pieces (part 1 and part 2 available on The Lesser of Two Equals), “Justified” is a show where it’s really hard to find a reason to dislike it. Centered around Elmore Leonard’s Stetson-sporting, quick-drawing U.S. Marshal Raylan Givens, it’s a unique show that has the feel of a Western saga married to the modern crime procedural. In any of the original episodes, you could expect to see well-written dialogue, a selection of vivid character actors and an understanding of exactly when to turn up the adrenaline with a gunfight. If it had a fault in those episodes, it was its inability to strike the balance between episodic and serialized television, and tended to focus on stand-alone plots that were well-constructed but still felt disposable. A large part of that was the looseness of one of the show’s main arcs – the Miami drug cartels who held a grudge against Raylan for gunning down one of their underbosses – and the second season starts on a high note by resolving that plot almost immediately, picking up the action right where the finale left off in ten minutes of tight, almost cinematic denouement. It doesn’t take the cartels off the table entirely, but it does give that storyline a sense of resolution – free of their influence and somewhat redeemed in his old bosses’ eyes, Raylan can now do whatever he wants, up to and including getting back his old slot in the Miami marshals’ office. So what does he do? He goes back to Kentucky, where his boss wants to reassign him, his father tried to shoot him, his ex-wife is cuckolding her husband and his former friend is sitting on a powder keg of emotions. 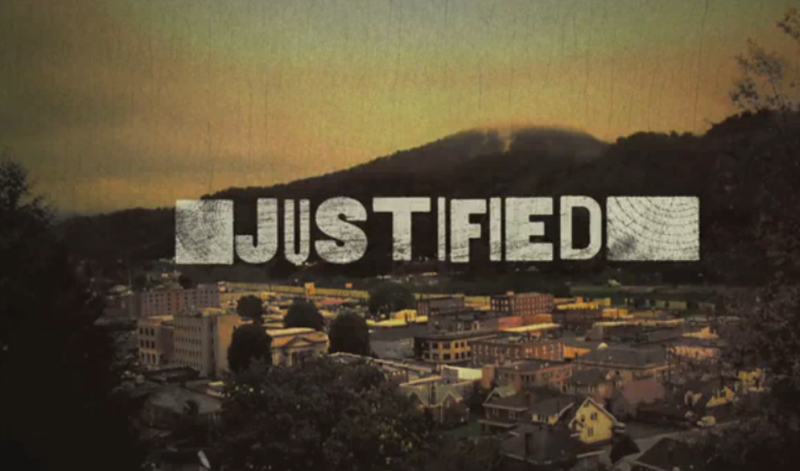 Beyond characters, the show is also learning to reward viewers who are paying close attention – it’s too well-constructed to give Raylan the catchphrase “Justify this” but patterns are beginning to emerge in the dialogue. On at least two occasions, characters have both cut off a longer explanation with an “I know what that is” or explained a bluff after the fact with the excuse “No, but it sounded good.” The third episode in particular was full of callbacks to the pilot, including a scene where hapless con Dewey Crowe recycles Raylan’s dialogue to hilarious effect. But just because the show has deepened its past, it’s in no way running in place. 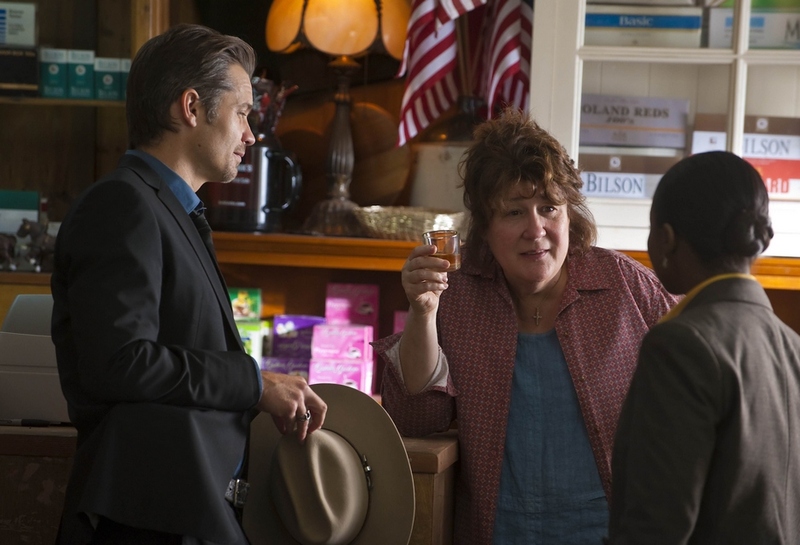 With the resolution of the Miami storyline – and most antagonists wiped out in the aptly named finale “Bulletville” – the show has brought out pot farming-family the Bennetts to fill the void in Raylan’s life.The clan is headed by matriarch Mags (Margo Martindale, who as records clerk Camilla Figg centered a rare compelling subplot in season 3 of “Dexter”), a far different animal to any of the assorted gun thugs and gangsters who Raylan tangled with in the first season. Arlo says she’s just “an old lady helping people with their glaucoma and stomach problems,” but it’s clear that she carries herself as the situation dictates, be it as a disapproving mother, matter-of-fact businesswoman or ruthless killer – and all in one terrific scene. Martindale is radiating charisma in this role, and the writers are very cleverly leaving you wanting more by doling her out in bits and pieces as opposed to being a clear central antagonist. In these episodes, the show’s mostly leaving the early plot development to her sons Dickie, Doyle and Coover (respectively played by Jeremy Davies, Brad Henke and Joseph Lyle Taylor), a group I find oddly reminiscent of Al Swearengen’s trio of henchmen in “Deadwood.” Much as Johnny Burns, Dan Dority and Silas Adams did, they go across the spectrum of intelligence and meanness, and the tension as they circle Raylan is palpable. A fairly contentious past is allued between all of them – particulary in the ugly limp Dickie sports and the cold stares between he and Raylan – and it’s a foregone conclusion that at least one of them’s going to do something drastic very soon. On the other side of the law, the writers have thankfully figured out how to better incorporate Raylan’s fellow marshals. Despite being credited in the opening titles, Jacob Pitts and Erica Tazel were given precious little to do as Raylan’s fellow marshals Tim and Rachel, mostly there as an extra body in the office. (The showrunners usually claim that it was a budgetary issue in the first season, but I personally think they just had more fun writing for Olyphant and other major players). In the last four episodes, shootings and quiet discussions over bourbon have managed to flesh both out into more mature characters: Tim’s gotten to show off his Army sniper skill with some impressive shooting, and Rachel’s been humanized by her discomfort at local prejudices and her less than perfect upbringing. They’re still not as interesting as any of the Bennetts, but they’ve become more than background players – especially if Tim’s really as bothered by his shootings as the show seems to imply he is. And yes, I’ve now gone hundreds of words without once mentioning the show’s other acting powerhouse, Walton Goggins as militia founder turned religious zealot – largely because of all the pots the show’s cooking right now his is the slowest-boiling. After the traumatic events of the first season, Boyd has clearly suffered a crisis of faith and has gone back to the simpler days of working in the mines and drinking quietly afterwards. (And rooming with Raylan’s ex-girlfriend Ava, which is only further complicating the history the three share.) Raylan and Boyd have shared some terrific scenes in the past, and have had some similarly strong ones in the last four episodes, but most of Boyd’s interactions boil down to people saying he really hasn’t changed at all, and him half-heartedly protesting. His character – and his story by extension – has felt adrift, but it’s beginning to seem apparent that Raylan’s disbelief and scontinual prodding by interested parties is going to push him in a potent direction. And that’s what’s keeping “Justified” so compelling to watch, beyond the performances and the storytelling: the continual feeling that what’s happening is building to something bigger. In the last episode, Mags lashes out at her sons for bringing Raylan’s attention to Harlan when they have “bigger plans – which do not need a federal marshal snoopin’ around!” With threats to the side and the stable of dangers, it really does feel that the writers have thought out what’s coming next rather than just throwing Raylan into random situations, and now that the show has had four episodes to set up some early moves (including an obvious Chekov’s wristwatch) it legitimately feels like we’re moving into a second act. Things are stirring in Harlan, and while Raylan’s trying his damnedest not to rack up a body count, it’s a sure thing that in the next four episodes the status quo will not hold. I can’t wait to see what comes next, and it’s not too late to grab on for the ride. This entry was posted in TV Criticism and tagged Elmore Leonard, FX, Harlan County, Jeremy Davies, Justified, Justifying, Mags Bennett, Margo Martindale, Raylan Givens, Season 2, Timothy Olyphant, Western. Bookmark the permalink.